Healthy meals don’t have to be complicated – or flavorless! 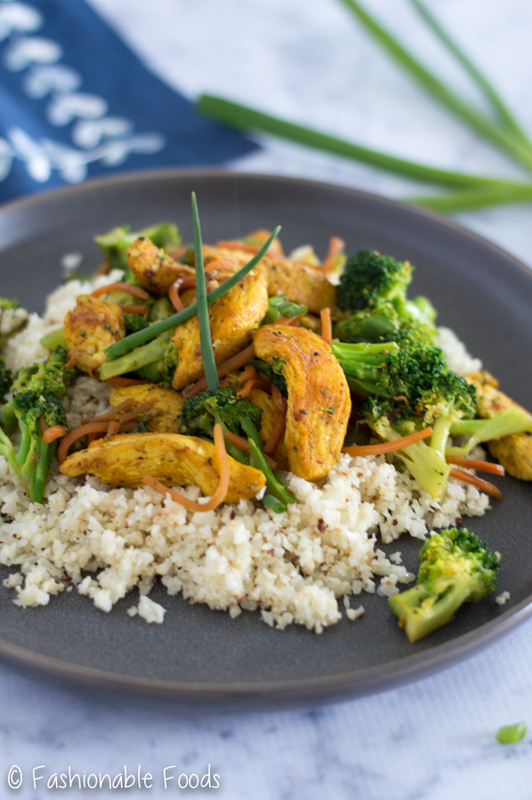 You’ll be surprised at how quick and tasty this turmeric chicken stir fry is. 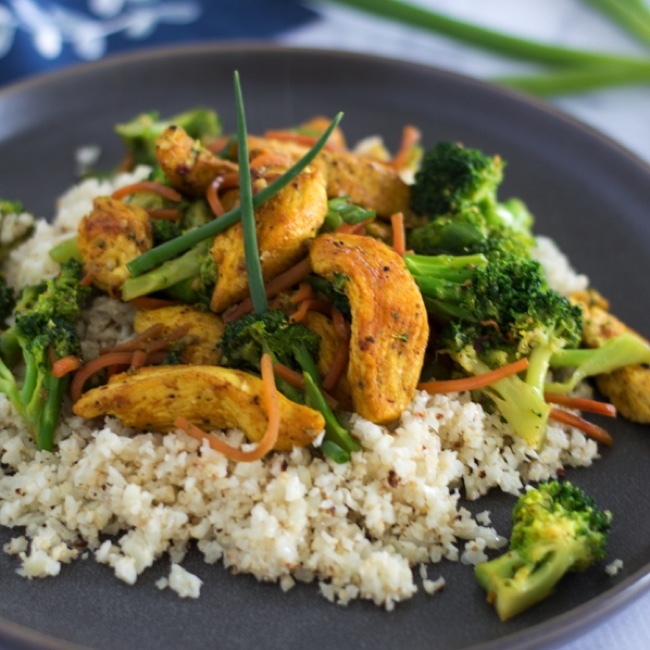 Serve it over cauliflower rice for the perfect weeknight meal. It’s supposed to be warm this weekend. I don’t know about you, but I’m ready for winter to be over. It’s been downright frigid and I’ve had enough. Usually my distaste for winter doesn’t happen until February, but this year it has hit me early. Why oh why can’t it be spring?! ? I have warm sunshine and fresh spring produce on my mind. ? Enter a fresh and healthy meal to take away the winter blues. Let’s hear it for quick and healthy dinners! 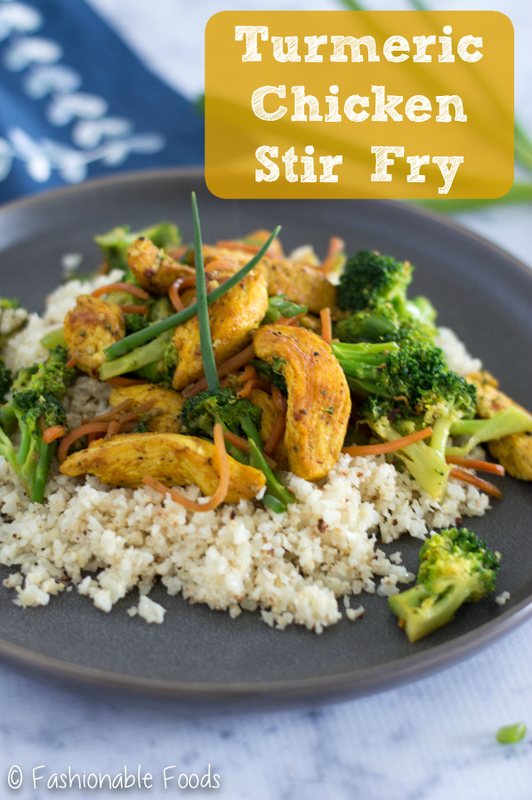 Stir fries are the PERFECT weeknight meal for when you need something healthy, tasty, and fast. 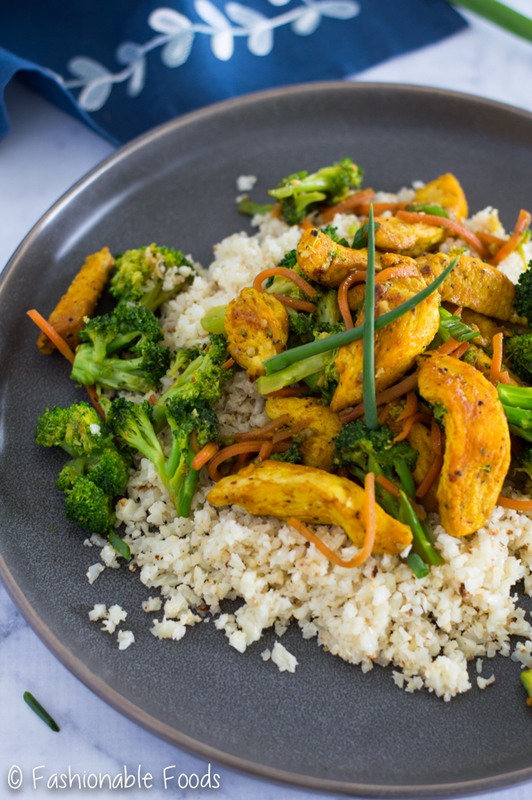 This turmeric chicken stir fry checks off all of the above. Who doesn’t want more recipes like that in their life? You don’t have to make complicated food with tons of ingredients in order to have tasty food. All you need is a well-stocked pantry and you can put together a stir fry in no time. This is especially important if you’re doing Whole30. If you don’t have some quick, no-brainer meals up your sleeve, you’re setting yourself up for failure. Whole30 is only successful when you plan ahead and never let hanger strike. <– I speak from experience. ? 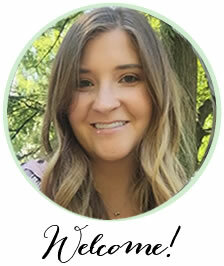 The hubs and I decided last week we needed to really buckle down and do a reset. He was carrying around some extra weight and I was wanting something sweet everyday. I’m not a big sugar/dessert person, but after all the extra sweets during the holidays, I found myself craving sugar a lot. That’s how I know it’s time to reset and rid myself of the “sugar dragon”. Today is day 5 and I’m feeling fantastic already… and I’ve been thoroughly enjoying all the yummy food! Let’s talk about all the yumminess happening here. This whole dish took me about 15 minutes of prep time, including roasting the cauliflower and running it through the food processor. If you don’t want to make your own cauliflower rice, you can shave off more time by using store-bought. If you’re not a big fan of cauliflower-rice, try roasting your cauliflower first! It makes a huge difference in the final texture and adds more flavor. Simply toss cauliflower florets with some olive oil, salt, and pepper and roast at 425º for about 10 minutes or until it’s beginning to caramelize, but is crisp-tender. You don’t want to overcook the cauliflower or you’ll end up with mushy rice. 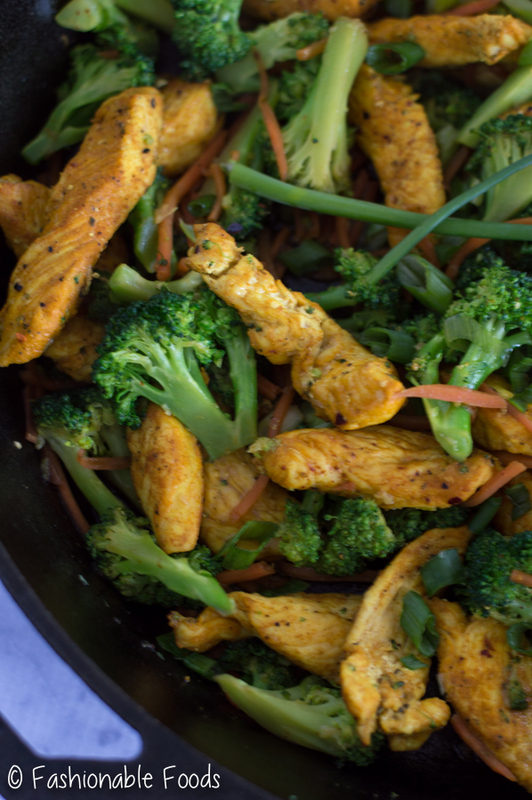 I’m positive this turmeric chicken stir fry is going to be a staple for our Whole30. And you don’t have to be doing Whole30 to enjoy this! If you like delicious food, you’ll certainly love this one. ✌? 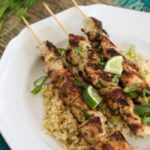 Healthy meals don’t have to be complicated – or flavorless! 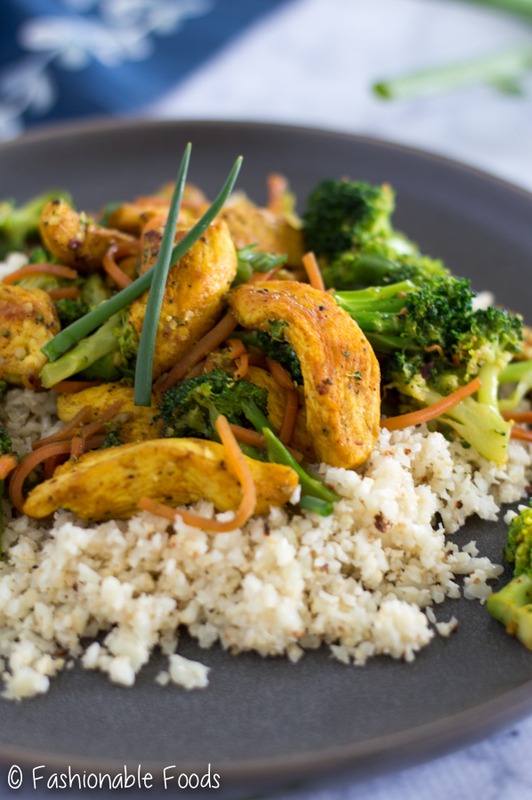 You’ll be surprised at how quick and tasty this turmeric chicken stir-fry is. 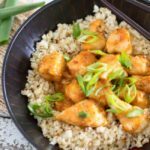 Serve it over cauliflower rice for the perfect weeknight meal. In a small bowl, combine the turmeric, salt, pepper, ginger, and coriander. Place the chicken in a large bowl and toss it with the spice mixture until well coated. Heat a large skillet or wok over high heat. Once the pan is hot, add a few drizzles of oil and then add in the chicken. Stir-fry the chicken until golden on each side, about 3-5 minutes. Transfer to a plate and set aside. Stir-fry the broccoli and carrots until crisp-tender, about 3-4 minutes. Stir in the garlic and add the chicken back in. Pour in a few dashes of coconut aminos and stir. 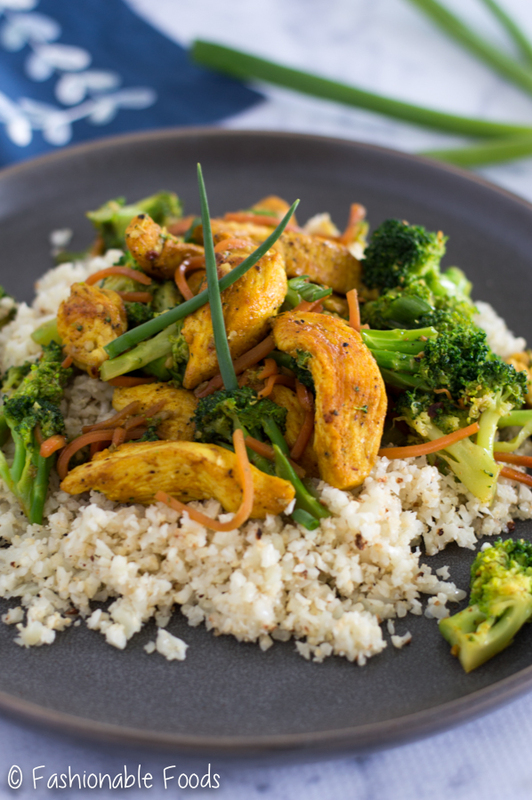 Serve the stir-fry over cauliflower rice and add more coconut aminos and red pepper flakes if desired. 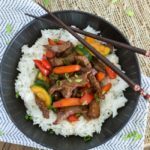 Simple yet healthy and delicious recipe to try. Thanks so much for sharing. I love chicken. This with turmeric and the other veggies gives me a reason to eat more healthily. I’ll add this to my list of to-try recipes. Thanks!